iSoftBet has released a pokies game which is sure to appeal to the nostalgic arcade gamers out there. If you miss the days of Space Invaders and Pacman or would rather play Super Mario Brothers on the original Nintendo than indulge in the lifelike graphics of the latest Xbox games, then the Mega Boy pokies game is for you. Mega Boy intentionally uses old-school graphics to tip its hat to the golden era of video gaming, complete with retro sound effects and 8-bit graphics, so if you remember a time where the Gameboy reigned supreme, take Mega Boy for a spin and enjoy a trip down memory lane. iSoftBet games aren’t as widespread as the gaming giants like NetEnt and Microgaming, so you’ll only find Mega Boy at a small selection of our recommended online casinos. We recommend Slots Million as the best place for online punters to give Mega Boy a go. Slots Million offers the option of playing for free in demo mode first, and when moving on to place a real money bet there are plenty of safe deposit options to choose from, including Visa, MasterCard, Skrill, Neteller, Paysafecard and direct bank transfers. New players signing up at Slots Million using our links will receive a 2X matched deposit bonus up to $100 when depositing real money for the first time. You can also try other games from iSoftBet, like Basic Instinct, Beverley Hills 90210, Rambo, 24, Platoon and Kobushi. 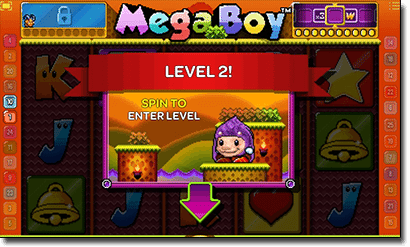 Mega Boy uses a standard five-reel format with 25 set paylines. The only customisable option is the coin size, which can be increased or decreased using the arrows on the Coin Value button. Coin sizes available are $0.01, $0.02, $0.05, $0.10, $0.20, $0.50 and $1.00. With 25 active paylines, this makes for a minimum bet of $0.25 and a maximum bet of $25.00. An auto-play feature allows you to pre-set up to 100 spins, with the option of stopping the auto-play function if your credit goes above or below a specified amount. 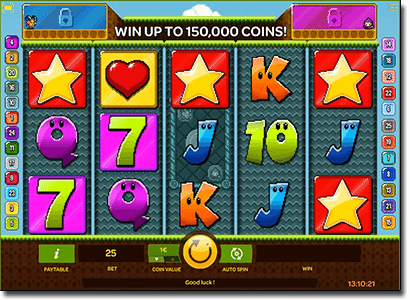 Once your desired bet amount is in place, just hit the yellow spin button and kick back and enjoy the retro 8-bit graphics, with standard symbols made up of purposely pixelated stars, hearts, cherries, liberty bells and lucky sevens. The wild symbol is clearly marked in a cloud of blue smoke, and can replace any symbol to form a winning combination, except for the special characters. 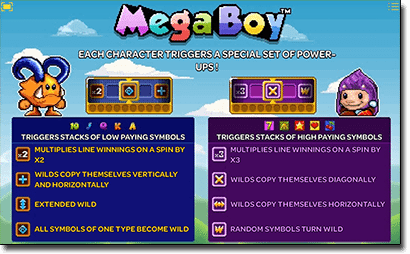 An appearance of the wild symbol in the very middle of the reels will trigger Mega Boy’s unique bonus feature, where one of two special character symbols appear. Younger players or those who prefer modern, high-def animation may be put off at first glance of Mega Boy, but we urge you to move through your initial disinterest and give this game a go. Mega Boy is intentionally supposed to look older, which iSoftBet has pulled off with flying colours. The addition of the special character bonus features adds a lot of excitement to this game, along with some great winning potential. This game is a genuine tribute to the video games of the 80s and 90s, and if you ever spent hours playing Sonic the Hedgehog on your Sega Mega Drive, chances are you’ll love Mega Boy.